These mini truck building toys take it easy on the environment while standing up to years of play. Designed by Jim & Luke Barber, this series of mini hybrids take it easy on the environment while standing up to years of play. The kid-friendly pieces of these take-apart toys are manufactured using an eco-friendly combination of reclaimed sawdust and bioplastic, the same composite material used for many outdoor decks and furniture because of its strength and resistance to weather damage. Each part of these kid-tough toy trucks is designed with just a little "wiggle room" so that children with developing motor skills can have fun making their own, out-of-the-ordinary vehicles that can be taken apart and put back together again and again. Made in Danbury, Connecticut. 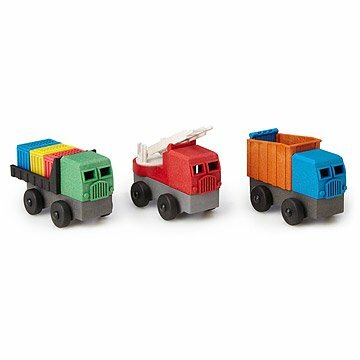 The idea behind Eco Trucks is to bring toy manufacturing back to the United States. After the toy recalls for lead paint, Jim Barber decided to find out what could be done to make safer toys. This lead him to the idea of using Wood Plastic Composites (WPC) in his toys. This is the same material found in many outdoor decks and furniture, used because of it’s strength and resistance to weather damage. By using this material, he was able to create a toy that has the look and feel of a handmade wooden toy, but with features and details too complex to be mass-produced. All he needed was a toy designer, so he brought in his son, Luke, who designed the toys using a computer aided design program (CAD). Luke then printed them out on a 3D printer to create test units that kids could try. In this way he refined his designs and made toys that kids love. The toys are designed for a 3 year old, just outgrowing “baby toys”, but still too young for complex building toys that require precision and the ability to read an instruction manual. Each part is designed with just a little “wiggle room” so that children with developing motor skills are not frustrated if the parts aren’t matched up exactly. By solving a simple 3D puzzle, the child is rewarded with a fully function toy that can be taken apart, put back together and taken apart again. Plus, each toys parts can mix and match the other two trucks to create new combinations of colors and parts, teaching creative play and encouraging an active imagination. Hand washable. Clean with soap and water. I bought two of these trucks as a gift for my good friend's two boys. I love how you can interchange parts. I also love how sturdy each part is. I know they'll get a lot of fun play out of these!